We make projects successful and teams more effective. Group Atlantic’s focus is to provide our clients exceptional quality and lasting value by enhancing the coordination among 3 key critical success factors: People, Process and Technology. Group Atlantic improves our client’s Return on Investment in technology by helping them make more effective use of their installed technology to deliver business results. We close the gap between strategy and execution by increasing the effectiveness and efficiency of the business unit-technology relationship. Our emphasis is on measurable business results—not about fads, and not about pet theories. Our consultants average more than 25 years of industry experience. We lead thought on industry practices, translating theory into real-world implementations. Our consultants take responsibility for helping you prevail over the business challenges that brought you to us in the first place. Providing services of exceptional quality and lasting value. Jeff Rein, CEO, Walgreens Co.
“Group Atlantic has worked with QuesTek to improve their project management practices, allowing them to retain the flexibility of a small organization and yet integrate within the project management structure of much larger corporations and the federal government. These new capabilities had aided QuesTek's growth and become a large part of our perceived value with our clients”. “I have known Group Atlantic for several years through our joint association with the Chicago Software Process Improvement Network (C-SPIN). During one of our frequent conversations I relayed a business issue that I was having concerning outsourcing and the need to tangibly measure the productivity of my commercial software development team against other options for development (i.e., outsourcing). The net of this was should I outsource my company's commercial software development or keep it in house? Through Group Atlantic's extensive business experience and business contacts they were able to put a measure program in place that allowed me to make a well informed business smart decision. Without Group Atlantic's assistance I believe I would have been forced to make a decision based strictly on corporate pressure and trends and not on what was best for my business." "I've had the pleasure of working with Group Atlantic at a number of companies and on different IT projects. 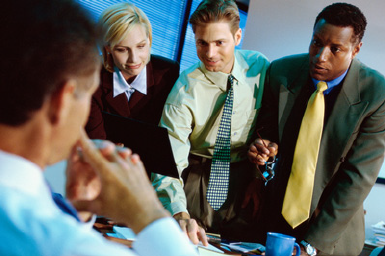 Group Atlantic has consistently provided value with expertise in focused areas and high quality counsel and feedback. I recommend Group Atlantic to my friends and colleagues regularly." for Project Management workshops. I engaged Scott in July of 2013 to create a day and a half long, intensely focused workshop to rapidly skill up new members of my organization. Scott was able to condense and deliver content from several of his standard workshops into an effective custom workshop for my team. The benefits were immediately realized as my Project Managers and Team leads were able to communicate in a common vernacular as well as act in a coordinated fashion." "Group Atlantic did a great job in putting together a very direct and concise, one-day seminar on "Better Testing, Better Products". Group Atlantic's knowledgeable, busness value added approach to the testing concepts really provided a great perspective on what makes projects (and business) successful. Group Atlantic's inclusive facilitation style kept us all involved and made the day go by very quickly. This was a great starting point for further development from Group Atlantic." "Group Atlantic engaged with us to get our Product Owners trained on Agile methods. We had a wide variety of Product owners with varying levels of expectation, knowledge and approaches. Group Atlantic did a fabulous job in engaging with them on a variety of Agile topics beyond the common textbook items which was appreciated by everyone. Group Atlantic was very professional and returned for a followup session with the Product Owners out of their own volition to ensure the lessons learnt were practiced. I would recommend Group Atlantic to any organization in need of injecting an innovative spirit and Agility into their Technology development processes." Many management paradigms have come and gone, yet there is still room for substantial improvement within many organizations. Why? Because most solutions focus on implementing the specifics of a particular framework rather than what ís appropriate and beneficial for an organization. Group Atlantic delivers tangible results that contribute to the long-term success of our client companies. We do not deliver just another framework, but a systematic solution specifically tailored for each client. While successful solutions pursue an appropriate blend of what is ideal and what is practical, the success must be achieved through collaborative effort. Successful client relationships are built on the trust that develops from successful collaborations. Group Atlantic is recognized by senior executives of large corporations as the management consulting firm that provides services of exceptional quality and lasting value. Content Copyright 2017. Group Atlantic, Inc. All rights reserved.